The CBSE had said that a fresh test for Class 10 Mathematics paper may be held only in Delhi, NCR and Haryana. Express photo by Vishal Srivastav. THE CENTRAL Board of Secondary Education’s (CBSE) decision on Tuesday to not hold a re-test of the Class X Mathematics paper was based on the evaluation of 1,000 randomly selected answer scripts from examination centres in Delhi, Panchkula and Patna regions, School Education Secretary Anil Swarup told The Indian Express. “The Board compared the pass percentage of these (1,000) students to the corresponding figure for last year and found that there was no unusual spike or change in performance. In fact, the pass percentage of this sample size is less than that of last year,” he said. The pass percentage of the sample evaluation in the Delhi region was 89.36 per cent, as against 93.62 per cent last year. Similarly, 84.77 per cent of the students evaluated in the Panchkula region passed the paper this time, as opposed to 99.18 per cent last year. 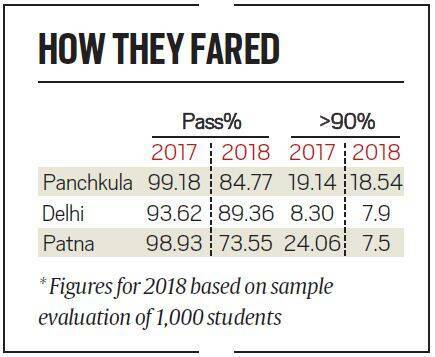 In the Patna region, the sample evaluation threw up a pass percentage of 73.55 per cent, compared to 98.93 per cent in 2017 (see box on page 2). Last year, the Class X board exam was optional. In other words, although the question paper was set by CBSE, students could opt to have their paper evaluated either by the Board or their school. So last year’s pass percentage is an average of the Board results and internal evaluation by the school. CBSE-affiliated schools across the country are divided into 10 regions. While the Delhi region includes schools from the Capital and National Capital Region (NCR), Panchkula region includes schools in Haryana, Punjab, Chandigarh and Jammu and Kashmir. Schools in Bihar, West Bengal and Jharkand are categorised under the Patna region. “Had the Class X paper been a competitive exam, we would have held a re-test without question. It is for this reason we announced re-examination of the Class XII Economics paper, because it has serious implications for the student’s future,” he added. The CBSE gave the same reasoning in its statement on Tuesday. “Class X examination is essentially a gateway for Class XI, it thus remains largely an internal segment of the school education system. It is therefore felt that the board must address the primary concern of a large section of the students. Therefore, the Class X Maths re-examination will not be held anywhere in the country,” it said. “On the other hand, Class XII exams are a gateway to higher education and various professional competitive exams which have limited seats… Therefore, giving undue advantage to a handful of beneficiaries of the alleged leak of the Economics paper would not be in larger interest of the students,” it said. The Board said a random evaluation did not indicate “sudden spikes or unusual patterns, giving any impression of passing on widespread benefits of alleged leaks”. However, after the complete evaluation, if the Board finds an unusual pattern in performance of students at a particular centre, action will be initiated against the centre. “We want to catch the culprits, not punish the students,” said Swarup. On March 28, the CBSE had announced that it would hold re-examination of Class XII Economics and Class X Maths papers, following complaints of paper leak. Two days later, it said the Economics re-test would be held on April 25, while the Mathematics re-test, if required, would be held only in Delhi-NCR and Haryana in July. The HRD Ministry, meanwhile, has constituted a high-powered committee of experts to examine the conduct of CBSE examinations and suggest measures to make the process foolproof. The committee, headed by former higher education secretary V S Oberoi, will submit its report by the end of next month.